How can we interrupt the isolation of disabled, challenging and other ‘different’ children and adults? This is our lead workshop/training day and is both a values primer and a practical guide to successful strategies for developing inclusive practice in educational and non educational settings for children and young people of all ages. This is practical plus being a ‘hearts and minds’ day. How can we interrupt the isolation of disabled, challenging and other ‘different’ children and adults? This is our lead workshop/training day and is both a values primer and a practical guide to successful strategies for developing inclusive practice in educational and non educational settings for children and young people of all ages. This is practical plus being a ‘hearts and minds’ day. What does inclusion mean? Can we imagine what an inclusive school look like? What do we have to do? The day gives those present opportunities to reflect on their attitudes and practice in relation to the inclusion of children and adults who are different or challenging. The Keys can be presented as a powerful interactive Keynote for large conferences. A great way to launch a conference as the first key is ‘welcome’. ‘Being able to share views and opinions on what it means to run an inclusive provision/setting’? How do we go about including high profile children or young people? What does inclusion have to do with me? 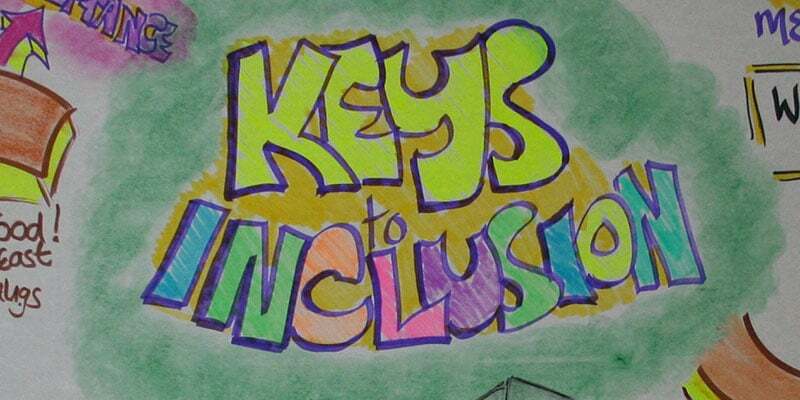 Best delivered over the course of a full day, ‘Keys to Inclusion’ introduces participants to 6 guiding Ideas that underpin inclusive practice.